Gente di Mare Italian Genealogy › Community Forums › All Things Italian › Recipes › what do you call this stuff? Community Forums › All Things Italian › Recipes › what do you call this stuff? Posted: Fri Jan 02, 2009 11:32 am Post subject: what do you call this stuff? Last night we went to my husbands sisters house. She had these people from italy there..who were visiting the US. They were from a town, in the same province as my mothers family came from. They were with these other people, that lived here, the older woman spoke broken english. When we had dessert, my sis in law put out this stuff that I havent had in years. The woman made it. I have no idea what you call it. Its like peanut brittle..only its almonds in burnt sugar..not really burned..but dark. I think you have to cook the sugar and work it. What is the name of that? Anybody know? Posted: Fri Jan 02, 2009 12:14 pm Post subject: Re: what do you call this stuff? Its called torrone/i and its exactly like peanut brittle. We make it every year along with some other treats that I just can't seem to get enough of. There are variations though. I will take a picture later today and post it to see if it's the same thing as you are talking about. Posted: Fri Jan 02, 2009 12:33 pm Post subject: Re: what do you call this stuff? Torrone is white..well the kind I always had. I have bought it by the pound, cut off a huge block..and also boxed, in little individual boxes..Those had a thin wafer on top. This isnt that..its burned sugar and almonds. I was trying to figure out where we got it. My mother didnt make it. I think they sold it at the italian bakery. This woman made hers. Posted: Fri Jan 02, 2009 12:37 pm Post subject: Re: what do you call this stuff? My mom's isn't white either..it looks almost identical to peanut brittle..but it has almonds and peanuts and some other nuts. Its held together with something clear and then she adds some sprinkles on it for color. She always called it torrone although I know that its not the traditional kind. Perhaps its common to the Southern Italian provinces? Maybe someone else can help here..
Posted: Fri Jan 02, 2009 12:49 pm Post subject: Re: what do you call this stuff? Ok.. I think I found it. Torrone is nugat. This is the stuff. Man, is it good. Posted: Fri Jan 02, 2009 12:51 pm Post subject: Re: what do you call this stuff? I'm wondering if it's Mandorle Caramellate (Carmellized Almonds). Open link below for pic and recipe. Posted: Fri Jan 02, 2009 1:06 pm Post subject: Re: what do you call this stuff? Biff..the ingredients for that..look the same (lol I had to lookup how you say almonds in italian). I knew the other two things..water and sugar. The picture doesnt look like what I mean tho. It looks like the picture I posted. I found some recipes..some are those 3 ingredients..and others have those 3 plus either honey or karo syrup. I dont think the one the woman made had any honey, nor does the kind I have had in the past. It could have the karo syrup..which I think is used to thicken. I came home last night..just dying for more of it..lol There arent even any italian bakeries in this God forsaken area that I live in..for me to run to, to see if they have any. I couldnt believe some of my relatives, there last night..didnt know what it was. Posted: Fri Jan 02, 2009 1:23 pm Post subject: Re: what do you call this stuff? in Piedmont (NW Italy) at Christmas time, my grandmother used to prepare "il croccante" and my mother follows the tradition. I think it's known with this name all over Italy. It's melted sugar with either hazelnuts or almonds or whatever your imagination suggests. If you need details let me know and I will post them. Posted: Fri Jan 02, 2009 1:41 pm Post subject: Re: what do you call this stuff? Posted: Fri Jan 02, 2009 1:49 pm Post subject: Re: what do you call this stuff? OMG - you people are making me hungry!! I would sure love to see a recipie posted so I can try it! It looks great. Posted: Fri Jan 02, 2009 2:38 pm Post subject: Re: what do you call this stuff? Yes..it looked like that, but broken into small pieces. My husband and I were trying to figure out where we got this stuff (many years ago), since neither of our mothers made it. The only thing we can come up with, is we got it in the Italian bakery in our neighborhood. Now that I think of it..I used to buy torrone at the Italian feasts..I'll bet thats where I used to buy it...along with the torrone. Its really good..sorta sweet, yet a little bitter. Posted: Fri Jan 02, 2009 2:40 pm Post subject: Re: what do you call this stuff? 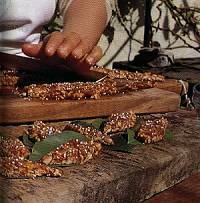 Cut the almonds lengthwise in wide strips, place them in the oven until golden, remove and allow to cool. Put a saucepan on the heat with the sugar, allow it to melt and when done add the almonds while stirring continuously until the mixture has combined well. Posted: Fri Jan 02, 2009 2:45 pm Post subject: Re: whahttp://www.gentedimaregenealt do you call this stuff? Pour sugar in a saucepan add a spoon of water and let liquefy on low heat, add hazelnuts and olive oil. Stir carefully and let cook for a few minutes till the sugar turns dark but not too much! (more or less a dark honey colour). Spread the mixture with a spoon, while still hot, on a marble top or oven paper and give it a square or rectangular shape. It's very hot and sticky! Let it cool and then cut with a knife into small pieces. Posted: Fri Jan 02, 2009 4:19 pm Post subject: Re: what do you call this stuff? Since this has now become a "recipes" thread, I am moving it over to the correct board. Posted: Sun Jan 04, 2009 11:28 am Post subject: Re: what do you call this stuff? This is one recipe I must try out! Eleven that link you posted has other fantastic recipes on it too!